Demand for everything “Frozen” is still red hot. The Oscar-winning Disney film is the most successful animated film in box office history, with $1.14 billion earned worldwide, and its soundtrack is the top album on the Billboard 200 for the 12th straight week. Those numbers alone would make it a smash hit success for Disney, but the company’s broad scope also means that it’s making bank in many other areas, too. The Disney Store, for example, has seen such demand for “Frozen” merchandise that it has had to place strict limits on purchases by rabid fans (and their parents). Customers are limited to just two items of merch per order, both in stores and online. Items such as dolls and plush toys are only available on Saturday mornings, when the store opens. Further, little fans of Elsa the Snow Queen, have been so eager to dress up like their heroine that the store has long been sold out of character costumes. In a post to the store’s blog this week, Disney said that stores should begin receiving new orders of Elsa costumes soon, and individual locations will hold lotteries on Saturday mornings to determine who can purchase one of their very limited supply. There is also a limit on “Frozen” merchandise purchases at the Disney Parks, too. The shortage of merchandise has led to huge prices for costumes and other items on eBay, as well as parents camping overnight to be first in line to get the goods. In fact, “Frozen” merchandise sold better than any other licensed toy in the first quarter of 2014. 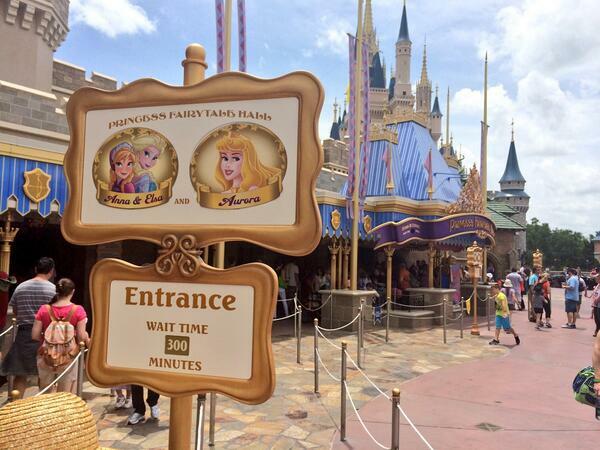 Meanwhile, at Disneyland, the wait time to meet Elsa and her sister Anna was 300 minutes on Thursday, according to a photo uploaded by a redditor.